Celery is another little-celebrated vegetable; its appearance in still life paintings is limited to walk-on parts supporting boars’ heads and copper pans (Jean-Baptiste Oudry), or filling the cornucopia of an 17th century Dutch market-stall. 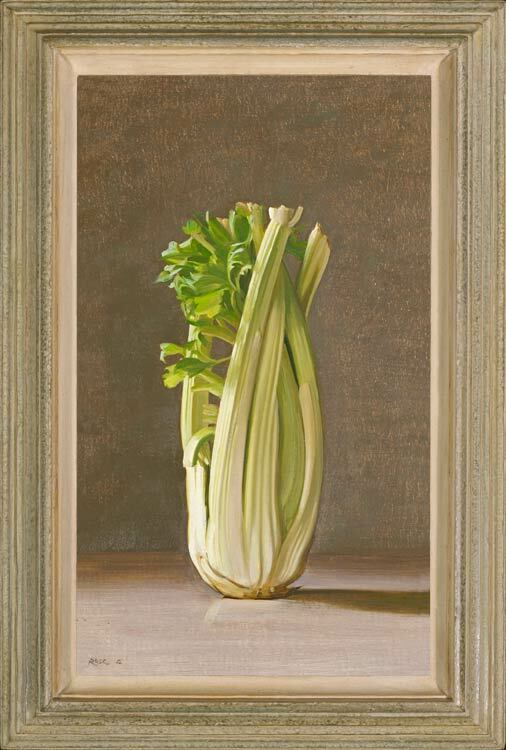 Except for Juan Sanchez Cotán’s depictions of its cousin, the cardoon, no artist seems to have made a head of celery the protagonist of a painting, let alone set it upright in the heroic stance we see in the present work. This has elements of Art Nouveau in the focused, frontal depiction, and, particularly, in the twining, curvaceous stems: compare it with Alphonse Mucha’s poster for Lorenzaccio by Musset, where Sarah Bernhardt muses in a swirl of velvet cloak. The lighting is soft and golden, harmonizing with the warm scumbled tones of the background, and giving the celery a vivid plasticity and animation.